What does the FFSG do? Inland Waters – Post 2020 targets: Our sustainable future depends upon targeted actions for conservation of inland waters. Representatives of several organisations – including members of the Freshwater Fish Specialist Group – have collaborated on preparing a one page ‘Information Note’ on the importance of incorporating the conservation of freshwater ecosystems into the post 2020 Targets. This note will be shared at the CBD COP 14 that will be held at Sharm El-Sheikh, Egypt, 17-29 November 2018. Please also share with your networks and ask them to share with Governments, CBD Parties and delegations. The purpose of this Special Issue is to assemble new information on African freshwater fishes, spanning all continental Africa, Madagascar, and other small islands around Africa. The deadline for submitting manuscripts is 31 October, 2018. More details about the Special Issue can be downloaded here. The February 2018 Issue of the OFI Journal – the official publication of Ornamental Fish International – has a focus on conservation. It includes some excellent articles, including one on Conservation and Management of Indian Ornamental Fishes, and an article by Scott Dowd, Chair of the Home Aquarium Fishes subgroup of FFSG, on Project Piaba: The fostering and advancement of ‘good.’ There are also three important letters in support of a sustainable ornamental fish trade in support of conservation and livelihoods, written by Rosie Cooney (Chair, IUCN SSC/CEESP Sustainable Use and Livelihoods Specialist Group), Devin Bartley (Retired Senior Fishery Resources Officer Food and Agriculture Organization of the United Nations) and Valerie Hickey (Practice Manager, Environment and Natural Resources Global Practice World Bank Group). Ornamental Fish International have very kindly allowed FFSG to post this Special Issue copy on our website, for access to our members and others with an interest in these subjects. If this issue is of interest to you, then please consider joining Ornamental Fish International. Staff of the World Fish Migration Foundation have shared a list of upcoming fisheries related conferences. The list may be downloaded here. A four-year, multi-million dollar project, funded by the Dynamics of Coupled Natural and Human Systems program of the National Science Foundation, has just started on Lake Victoria. The project is focused on the ways in which aquaculture might benefit the people and wild fishes of Lake Victoria (by reducing fishing pressure on the wild populations) and where it might disrupt the ecosystems in sensitive areas. The project starts with a critically important lake-wide fish biodiversity survey. You can follow updates on the project via blogs posted on ‘The Future of Lake Victoria’ on the Secure Fisheries website. Also check the FFSG Facebook site for notification of updates. The project team is international and multidisciplinary in scope, and includes a member of FFSG (Les Kaufman, Boston University/New England Aquarium) and links closely with work being led by IUCN’s Freshwater Biodiversity Unit on validation of freshwater Key Biodiversity Areas in Lake Victoria. Check out the press release for World Fish Migration Day. Also, check IUCN’s Amazing Species website for this week, which features the taimen. Segrest Farms, one the world’s largest wholesale ornamental fish distributors, has a commitment to not only find the best suppliers of fish, but also ensure their suppliers are following the best practices to ensure long-term sustainability and success. Hence, they have stated their support for Project Piaba – a project that is central to FFSG’s Home Aquarium Fish Sub-Group. Project Piaba focuses on sustainable capture of wild populations of Amazonian fishes. Project Piaba follows methods that do not represent a threat to those populations, because they are directed at species that have adapted to high levels of natural mortality by spawning in huge numbers. Project Piaba also focuses on the economic incentives that the ornamental fish trade has on the local communities, providing income for more than half of the region’s inhabitants who would, otherwise, be forced to work in environmentally destructive industries such as logging, mining, and ranching. Segrest Farms has been able to assist by offering their expertise in best practices for shipping and handling fishes. In addition, as the largest wholesale supplier in the US, Segrest Farms have the ability to offer these sustainable resourced fishes to retailers across the US, hence significantly supporting the income that is returned to the fisheries and communities. For more information, check the Segrest Farm blog, Segrest Farm website, and Segrest Farm Facebook site. Several members of FFSG contributed to an important paper, published in Science that highlights how the unprecedented boom in construction of hydropower dams in the world’s most biodiverse river basins is placing one third of the world’s freshwater fish at risk. Science 8 January 2016: 128-129. For more information also see discussions on IUCN’s website, and Conservation International’s website. An excellent new textbook on the “Conservation of Freshwater Fishes” has been published by Cambridge University Press. 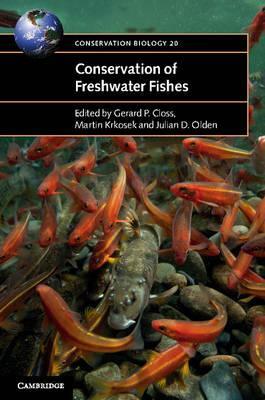 Co-authors include various members of FFSG and the book opens with two chapters giving a review of the threats to freshwater fishes, each co-authored by Will Darwall (IUCN Freshwater Biodiversity Unit). Vishwanath Waikhom, FFSG co-chair for the South Asia region, receives the EK Janaki Ammal National Award for Animal Taxonomy. The award was conferred by the Ministry of Environment, Forests & Climate Change, Govt. of India, on June 5 – as part of the World Environment Day celebration held at Ganga Auditorium of the Ministry’s Building at New Delhi. The award was presented by the Hon’ble Union Minister of Environment, Shri Pakash Javadekar and is in recognition of Vishwanath’s contribution to freshwater fish taxonomy of the Eastern Himalaya. At the Aquarama 2015 conference held in Singapore May 28 – June 21 the IUCN Freshwater Fishes Specialist Group worked with the event organizers to convene discussions, panels, and a Strategic Development Meeting with the goals of developing a framework to maximize environmental and socioeconomic benefits as an outcome of the home aquarium trade. More information will appear in the next issue of the FFSG newsletter ‘Saving Freshwater Fishes and Habitats’. Information is also given on the Facilitators Network website. The LeCren medal has been awarded to former Global Chair of the Freshwater Fish Specialist Group, Gordon McGregor Reid. The medal, named in honour of David LeCren, a former Director of the Freshwater Biological Associations, Windermere Laboratory and the second recipient of the Beverton Medal, is awarded to individuals who have made a lifelong contribution to all aspects of the study of fish biology and/ or fisheries science, with a focus on conservation, training or public understanding of the discipline. Congratulations to Gordon. This is most well deserved. For more information see the Summer 2015 newsletter of the Fisheries Society of the British Isles. Please join us in welcoming Dr. Dmitry Lajus to the FFSG as the new Regional Chair for the Eastern Palearctic Region (formerly “Northern Asia”). Dr. Lajus will be taking over leadership from Dr. Nina Bogutskaya, who had very recently stepped down. Dmitry is an Associate Professor at Saint Petersburg State University in their Department of Ichthyology and Hydrobiology. Though he is new to the FFSG, Dr. Lajus has worked with some of our members in the past and comes highly recommended in the area of conservation. We look forward to seeing the work that he and others will accomplish in this very important region for freshwater fishes and habitats. A new publication coauthored by our previous Global Chair, Gordon McGregor Reid, and Geoffrey Moore is now available from the North of England Zoological Society. (From Press Release) Modern zoos and aquariums attract more than 700 million visitors every year worldwide and contribute more than US$350 million to conservation projects. The History of Zoos and Aquariums: From Royal gifts to Biodiversity Conservation celebrates the 75th Anniversary of SHNH – the Society for the History of Natural History in 2012 and the 80th Anniversary of Chester Zoo in 2014. Published with the support of Chester Zoo, the Society for the History of Natural History, the Linnean Society of London, the Bartlett Society and the World Association of Zoos and Aquariums, these accounts by historians of science, museologists and zoo and aquarium workers document zoos and aquariums in the past and present, peace and war. Moore, past president of the Society for the History of Natural History. Find out more at http://shnh.org.uk/news/historyzoosaquariumsnowavailable. Since the FFSG Annual Meeting in December, we have revisited the role of regional leadership for the group. After engaging in discussions with many of our Regional Chairs, we have undergone some changes in leadership. Dr. Paul Loiselle has agreed to sign on as Co-Chair for our Madagascar Region. He will join current Regional Chair Dr. Melanie Stiassny. 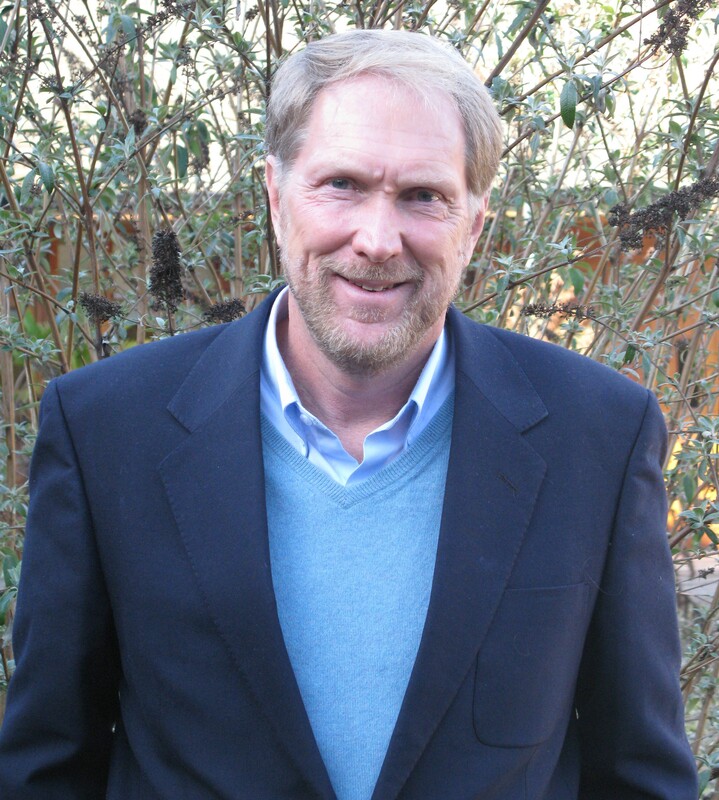 Paul brings over 50 years’ experience to this role and will be a great addition to the region. Dr. Amirrudin Ahmad is now Co-Chair to our Southeast Asia Region, where he’ll join Dr. Chavalit Vidthayanon to lead the region’s efforts. Amir will provide valuable input to this geographically and taxonomically diverse region. Lastly, Dr. Paul Skelton has decided to step down as Regional Chair for Southern Africa. Upon Paul’s recommendation, Dr. Olaf Weyl (new to the FFSG) will now serve as Regional Chair for Southern Africa. Please make sure to give these men a warm welcome. With around 200 members now, the FFSG will rely on the strength of regional activities now more than ever. Please remain proactive and supportive in your interactions with Regional Chairs. A new paper focusing on Huchen in the Balkans was co-authored by FFSG Regional Chair to Europe and Steering Committee member, Dr. Jörg Freyhof. 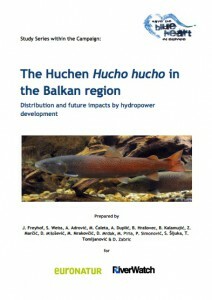 The study examined the species distribution as well as future impacts by hydropower development in the region. The study is a part of the “Save the Blue Heart of Europe” campaign organized by EuroNatur – European Nature Heritage Foundation (www.euronatur.org) and Riverwatch – Society for the Protection of Rivers (www.riverwatch.eu/en/). You can find the paper online (http://balkanrivers.net/sites/default/files/Huchen_Study_2015.pdf). A massive hydropower development plan threatens the species, which acts as a sensitive indicator species for some of the most ecologically valuable rivers in the basin. The data published in the paper are meant to serve as evidence of the need to keep many of the Huchen habitats undammed. The findings state that the existence of Huchen and proposed hydropower developments are incompatible. 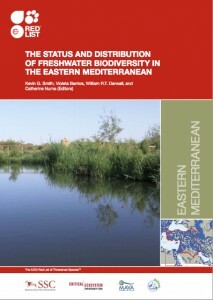 The IUCN Freshwater Biodiversity Unit (part of the IUCN Global Species Programme) recently published The Status and Distribution of Freshwater Biodiversity in the Eastern Mediterranean in conjunction with IUCN-Center for Mediterranean Cooperation. The full report is now available for download through our “Assessments, Reports, and Guidelines” page or directly from the “Publications and Resources” page of the FBU. FFSG members were involved in the research used in this report, and our European Regional Chair, Jörg Freyhof, in particular. IUCN’s World Commission on Protected Areas has published its book on Protected Area Governance and Management. 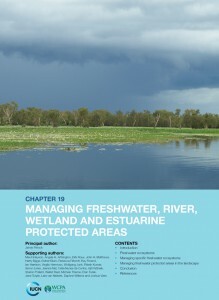 It includes a chapter on freshwater and estuarine conservation, co-authored by members of FFSG. The book will be the leading resource for conservation practitioners, decision-makers, and students of conservation biology and landscape planning, for many years to come. The book was officially launched at the UNEP-WCMC Protected Planet Pavilion, Sydney World Parks Congress on 15th November 2014, at an event attended by 300 people. The launch was one of the most successful events of the Protected Planet Pavilion. 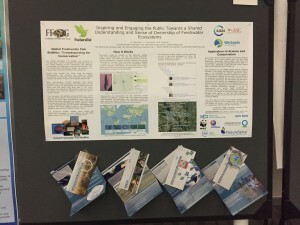 A subsequent side event was arranged on 17th November to launch the freshwater chapter. This was co-led by Jamie Pittock (Australian National University; and principal author for the freshwater chapter), Ian Harrison (FFSG, co-lead of the WCPA Freshwater Task Force, and co-author) and Becky Flitcroft (US Forest Service, and co-author). The side event was attended by members of FFSG and included short presentations from Russ Mittermeier (Executive Vice-Chair, Conservation International) and some of the chapter’s co-authors. 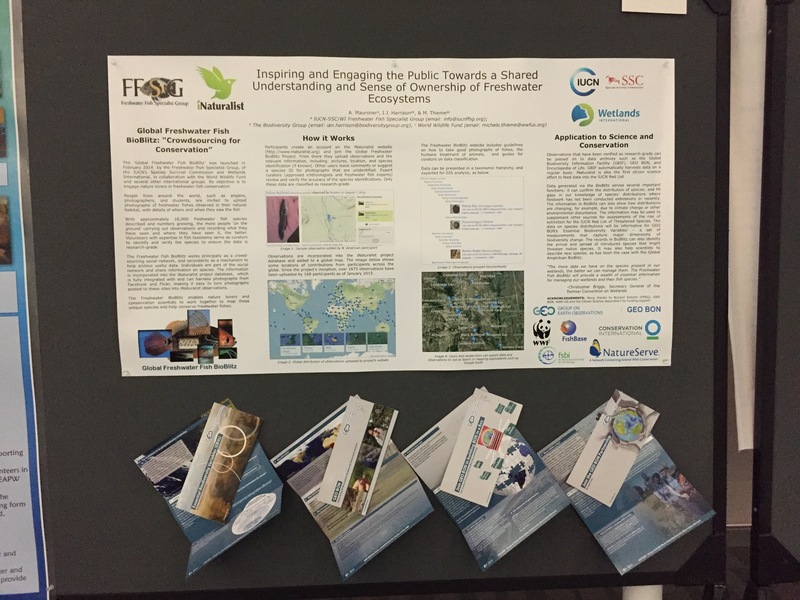 Thanks to generous support by WWF-US, GEO BON, Richard Sneider (FFSG Global Chair), and conference organizers, the FFSG was able to send its Programme Officer to the Citizen Science Conference 2015, held in San Jose, California on February 11 and 12. While attending the conference, Alex Mauroner presented one of the projects that FFSG coordinates in collaboration with several partners. Over 650 scientists, educators, and practitioners descended on the McEnery Convention Center for the inaugural conference of the Citizen Science Association (www.citizenscienceassociation.org). Attendees included citizen science participants, researchers, project leaders, educators, technology specialists, evaluators, and others – representing many disciplines – at any level of expertise. The FFSG was one of several groups working on wildlife conservation that presented their work. Alex presented a poster on the Global Freshwater Fish BioBlitz during the poster session and reception in the main ballroom on the first night. Approximately 100 posters were on display during the session as the 650-plus participants walked around to examine the various projects. During the two-hour session, Alex answered many questions about the BioBlitz with inquisitive conference-goers. He also discussed some of the potential outcomes, future analyses, and possible conservation implications with other scientists including the former Chair of the Citizen Science Association, who was particularly interested in the FFSG and this project. Alex also discussed the role of those organizations that sponsor the BioBlitz, such as GEO BON, WWF-US, iNaturalist, NatureServe, and more. He also distributed several pamphlets, provided by GEO BON, describing their work on biodiversity databases and the future role of Essential Biodiversity Variables (EBVs) as a means of cataloging biodiversity measurements required for study, reporting, and management of biodiversity change. There will be several freshwater events at the World Parks Congress in Sydney, Australia this November. A copy of the programme is available from the Congress website The World Parks Congress website. We have also created an annotated copy of programme events, which focuses on the “water” & “freshwater” events. It is available to view or download here. This amended copy of the programme is for all “water” events, and those highlighted in yellow are also tagged as “freshwater” specific. More details on all of the events can be found using the online WPC Programme site. 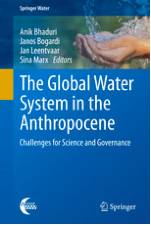 Members of the FFSG and the IUCN Freshwater Conservation Sub-Committee have co-authored, as part of an international collaboration with colleagues from several other NGOs and academic institutions, a chapter in the upcoming book The Global Water System in the Anthropocene: Challenges for Science and Governance. The chapter, which is entitled “Sustaining Freshwater Biodiversity in the Anthropocene,” stresses the importance of conserving freshwater biodiversity as a critical part of water resources management. The book which will be publicly launched on September 16 at the Center for Development Research in Bonn, Germany, will be an important resource for many different decision-makers, academics, and researchers. It includes several contributions from a conference in 2013, Water in the Anthropocene. Some 350 international water experts converged in Bonn, Germany, for this conference to discuss the challenges being posed by human impacts on the earth’s water systems, from glaciers, to groundwater, to rivers, lakes and deltas. The conference identified “the countless decades of neglect and millions of misguided decisions we make daily regarding this essential resource”, and searched for solutions in this new era of human dominated change. See the 3 minute film that accompanied the conference. The FFSG is pleased to announce the addition of a new Central Asia region. Up until now the FFSG did not have full regional coverage in the area. Two distinguished ichthyologists from the area, Dr. Bakhtiyar Kamilov and Dr. Bakhtiyor Karimov, both of the Uzbekistan Academy of Sciences, have agree to take serve as Co-Chairs for the new region. Freshwater fishes in the area face serious threats, which only reinforced our desire to expand FFSG activities and coverage in Central Asia. Priorities in the region include developing freshwater fish assessments as part of the global freshwater biodiversity program being led by Will Darwall and his staff at the IUCN Freshwater Biodiversity Unit in Cambridge. Additional projects will focus on basic and applied scientific research in the fields of aquatic ecology, ecotoxicology, impact of water quality on fishes, and fish biodiversity conservation projects. Other work will include studies on the impact of aquaculture technologies on the raising of fish and various issues unique to the Central Asia region. Please join us in welcoming the two new Co-Chairs and supporting efforts to help protect freshwater fishes and habitats in Central Asia and elsewhere. Questions or comments can be directed to info@iucnffsg.org. and accessories trade exhibition in the world (http://www.aquarama.com.sg). The 2015 Conference in Singapore will include a specially convened public aquarium committee launching a programme of sub-events aimed specifically at public aquarium personnel. This committee, consisting of Scott Dowd (Senior Aquarist at the New England Aquarium, Boston, USA; and FFSG Steering Committee), Ramón Barbosa (Senior Curator at the S.E.A. Aquarium in Sentosa, Singapore) and Rob Jones (‘The Aquarium Vet’ and veterinarian at the SEA LIFE Melbourne Aquarium, Australia) and co-ordinated by Aquarama Consultant, John Dawes. 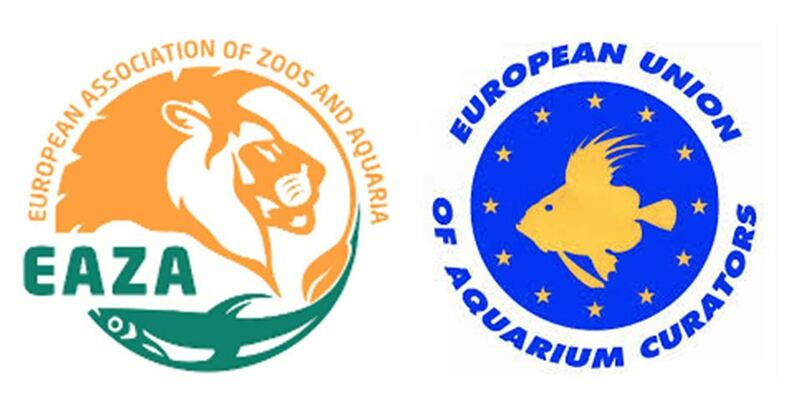 The Committee is devising a programme of activities focused on the needs of the public aquarium industry, fostering closer links between the home aquarium industry and public aquaria, and promoting opportunities for sustainable management of wild populations of aquarium fishes that support livelihoods for communities living in regions of biological importance. For more information about these exciting and important opportunities visit this webpage (http://ubm-asia.msgfocus.com/q/17LW3CCjNGYALiHMFafCXt/wv). As a follow up to the successful WFMD in May, organizers have recently published a report highlighting some of the events and achievements that occurred in over 50 nations worldwide. The report, which can be downloaded from the WFMD website, http://www.worldfishmigrationday.com/promotional-material, summarizes the types of issues addressed by the day’s events as well as some of its achievements. The overwhelming support from over 1000 organizations that participated in WFMD has led the organizers and sponsors to create the World Fish Migration Platform. This new Platform plans to host several events, including web seminars and an inaugural International Fish Passage Conference, which is scheduled for 23-25 June, 2015 in The Netherlands. To find out more about the WFMP, visit their website (http://fishmigrationplatform.com/). 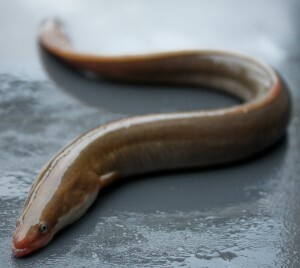 Beginning in March of 2013, the Anguillid Specialist Sub Group (ASSG) of the FFSG began the vital process of conducting a long-overdue assessment of freshwater eel species. It was to be the most comprehensive assessment of anguillid species to date. 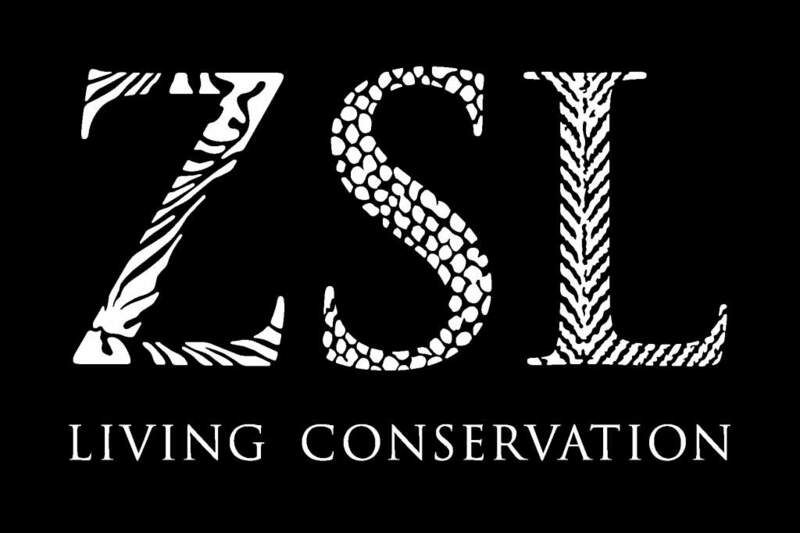 Last month, 12 of the 13 assessments conducted by the ASSG were published on the Red List (the last species is due to be added to the Red List in November). Three species were assessed as Threatened (one Critically Endangered, one Endangered, and one Vulnerable), four were Near Threatened, two were Least Concern, and three were Data Deficient. Freshwater eels face a host of complex threats, and assessments like these are merely the first steps on the road to successful conservation. To find out more about what the ASSG is up to, please visit their page on our website or read the related article by David Jacoby and Matthew Gollock in the latest issue of our newsletter. Following the successful Fish and Aquatic Invertebrate Taxon Advisory Group (FAITAG) Elasmobranch workshop in 2013, the next workshop will be taking place in Vienna this autumn. The goal of this workshop is to develop the strategy for freshwater fishes in public aquaria. In February 2014, Gordon McGregor Reid (Past FFSG Global Chair) received the SSC Chair’s Citation of Excellence in recognition for his exemplary, visionary and charismatic leadership of the Freshwater Fish Specialist Group, between 2004 and 2013. The Citation of Excellence, created in 2004, is awarded in recognition of outstanding contributions to the SSC. Workshops, supported by the FFSG South Asia office, are being organised on the 29th March and 5th April 2014, in Bangalore and Uttarakhand, to help secure the future for India’s endangered mahseers. We need YOU to submit your photographs of freshwater fish seen in their natural habitat. Whether you are an angler, photographer, student or nature lover, upload your photos with details of when and where you saw the fish. Experts will be on hand to help identify the species. This information can help scientists to describe new species, help assess risk of extinction, increase our knowledge on many species, and track the spread of invasive fish. Find out how you can be a part of it here!